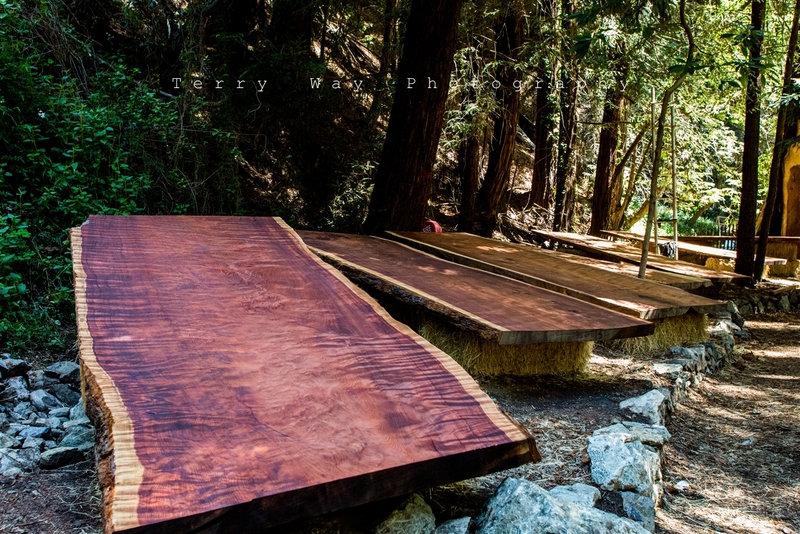 The world’s most beautiful redwood up for auction! ***REDWOOD AUCTION: Sunday, OCTOBER 4. Preview and sign-up 1PM - 4PM. Auction starts at 4PM. WELCOME! Sign our email list here to get all the updates! News flash! We’re having a second redwood auction on Oct. 4, 2015! To all who participated Thank You all for your incredible generosity and support during our inaugural redwood auction in Oct. 2014! All slabs from the auction were sold. We are proud to say that two went to The Wooden Palate in Los Angeles and two went to Pollaro Custom Furniture in New Jersey (check them out to understand why!). This is also great news for supporters of the arts in Monterey County and beyond as we look forward to bringing you more programs, music, workshops, film and a quiet place (!) in the future. So once again, from everyone at the Library, thanks so much for your support! extraordinary depth and beauty of pattern this tree has yielded. the trunk during the hundreds of years of slow tree-growth.